The first recorded (or recalled) Jewish community event on the Big Island was the Bar Mitzvah of Gary Natan Rothstein, the son of Jerry and Judy Rothstein, in Hilo in 1973. In August 1974, Roz Silver and her husband Bill moved to Kona from southern California. Disappointed not to find High Holiday services here, the Silvers quietly celebrated at home. As things occur, Gil Martin, food and beverage manager at the Kona Golf Club, noticed a mezuzah nailed to the Silver’s door jamb, and a menorah. Agreeing that it would sure be nice to have a Jewish congregation, they started to make contacts. Gil knew a couple from Hilo – he was Jewish and she was Japanese. They knew the Reichman’s in Pahoa. One contact led to another. When someone suggested they contact the Jewish Federation in Honolulu, the Federation not only provided prayer books for the 1975 High Holy Days, it arranged for Kirk Cashmere, who since became a prominent ACLU lawyer, to perform the service. The group, dubbed Aloha Beth Shalom, became the forerunner of Kona Beth Shalom. The first Passover Seder was held at the Kona Golf Course Restaurant, not open to the public that day. The restaurant provided a commercial kitchen with restaurant size cooking facilities, utensils, and space needed to accommodate the 70 seder reservations. Gil Martin and Roz Silver prepared the dinner. Matzos came from the Jewish Federation and kosher wine was available on the island. The menu included gefilte fish Hawaii-style made with mahi-mahi, ahi, ono and aku, chicken soup and matzo balls, roast chicken, vegetables with tsimmes, a mixed fruit compote, home-baked coconut macaroons, as well as charoseth and other seder plate items. For its final event of the Hebrew calendar 5735 (1976), the congregation held a Jewish Soul Food Picnic at the Hapuna Beach pavilion. With the distance so great between Kona and Hilo, several of West Hawaii’s Jewish kama’ainas (residents) decided in 1980 to base the congregation in West Hawaii where they and others could come together to worship. Thereafter it was known as Kona Beth Shalom. The original Board of Trustees included Morris Baker, President; Rosalind Silver, Vice President; Jerry Rothstein, Secretary; and Helen Rabin, Treasurer. Rabbi Julius Nodel of Temple Emanu El in Honolulu led the first Bat Mitzvah on Hawaii Island in August 1980 for Elise Rael Sachs, the daughter of Alva Sachs. Services were held at an outdoor pavilion at the Keauhou Beach Hotel. Rabbi Nodel, alternating with Rabbi Avi Magid, also of Temple Emanu El, returned to Kona monthly to lead Shabbat services. In August 1982, Gary Rothstein (Hawaii’s first Bar Mitzvah) returned to lead Shabbat Services and speak about his experience in Israel. He had become Torah observant and now lives in Jerusalem with his Israeli wife Advah and their children. In December 1983, Seymour Lewis’ grandson, Aaron Wyrick, led Shabbat Services for us, and in August 1984, our Board of Trustees selected Seymour Lewis to be the spiritual leader for Kona Beth Shalom. In 1985, the congregation acquired a Torah scroll with the assistance of Mark Talisman, Director of the Washington, D.C. office of the Council of Jewish Federations. The Torah, which was well over 250 years old, had belonged to the once-thriving Jewish community in Polna, in what is now the Czech Republic, where it remained in use until the Holocaust. The Nazis had stored the scroll and other artifacts for display in what they intended as a museum to an extinct race. After the War, the cache of artifacts and 1,564 Torah scrolls was discovered in Prague and transferred to the Westminster Synagogue in London where Rabbi Michael Berenbaum restored our scroll. Since the War, those Torah scrolls for which no European congregation remained have been made available for permanent loan to congregations in need of a Torah. 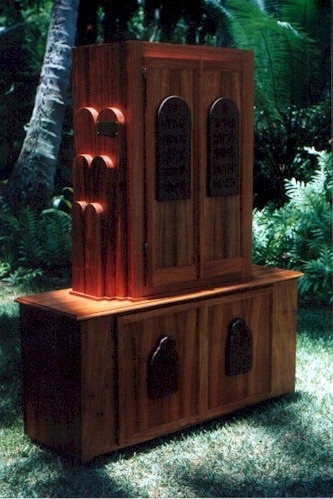 In March 1985, our Torah scroll, accompanied by Mr. Talisman, traveled from London to Honolulu and then to Kona where it was formally presented to Congregation Kona Beth Shalom and dedicated at Shabbat services on March 30, 1985. The Jewish Congregation of Maui gave us our first Aron HaKodesh at that time. In 2001, Joe Rosner, a long-time member of the Congregation, built a brand new Aron, designed by Morty Breier, using Hawaiian koa wood and incorporating that original Aron. Gifts from several KBS members (some deceased, some living) made possible the creation of this special home for our special scroll. Through the years, the congregation conducted Shabbat services at the Keauhou Beach Resort, the Kona Hilton Hotel, the Church of the Nativity, the Salvation Army Chapel and the Kona Surf Resort. Until 1995 we held services only on the last Saturday morning of each month. We then we added a Friday evening service followed by a potluck dinner. We returned to the Salvation Army Chapel after the Kona Surf closed in June 2000, but a fortuitous meeting with the new owner of the Aston Keauhou Beach Hotel at our 1999 Community Seder resulted in an invitation from him to return to where we started. The hotel acquired a new owner and was renamed the Outrigger Keauhou Beach Resort. We met there on Friday evenings and Saturday mornings on the fourth weekend of each month for many years, later on just Saturday mornings, and for holiday celebration. The Keauhou Beach Resort was permanently closed at the end of October 2012. Thanks to the remarkable generosity of one of our members, we now have a shtiebel in The Shops at Mauna Lani. We are continuing to explore the establishment of our own synagogue. Our congregation’s principal activity is to offer Jewish services and fellowship. Throughout our history we have continually celebrated Shabbat, celebrated the High Holy Days, conducted annual community Seders, observed many of the annual Jewish Holidays as they arise, celebrated Bar and Bat Mitzvot and the occasional B’rit Milah. Members of the congregation have led our prayers for most of our existence with different individuals rising to the occasion. The first was Seymour Lewis, one of our founders. Rabbi Richard Ettelson, who came to Kona from Honolulu to conduct Shabbat (and High Holiday) Services, followed him. When Rabbi Ettelson moved to the Mainland, Seymour Lewis’ daughter, Barbara Lewis, continued in the tradition of her father, who had also moved to the Mainland. During most of those years, Dr. Stuart Spielman served as president of the congregation. Michael Zola became president after Stu moved off island and Barbara continued to lead the congregation’s prayer services. Later, Dr. Barry Blum served as president of the Congregation for thirteen years and led most of the Sabbath Services with the able assistance of other members. In 2006, Dr. Blum retired from that position and Shari Berman was elected president. Shari not only led our services after that time, she became one of our primary Torah leiners (readers). For part of the 2008-09 season we had the pleasure of enjoying Cantor Kenneth Cohen of Honolulu lead services for us. In 2012, Shari accepted a professorial position at Hirosaki University in Aomori, Japan and Una Greenaway became our president. Since that time, different members of the congregation have led the services each month. To lead our High Holiday services our custom has been to invite a Rabbi here. This distinguished list includes Rabbi Maurice Hershman, Director of the Northern California & Pacific Coast Regions of the American Hebrew Congregations in 1980; Rabbi Wolli Kaelter, Professor at the Hebrew Union College in Los Angeles; Rabbi Gershon Winkler of California in 1984; Rabbi Richard Ettelson (Reform) from Honolulu; Rabbi Charisse Kranes (of blessed memory) from Novato, California, a graduate of the Hebrew Union College, in 1986; Rabbi Hanan Sills (Renewal) of Eugene, Oregon; Rabbi Leo Fettman, (Orthodox) a cantor from Omaha and a Holocaust survivor; Rabbi Marvin Kirsch (Conservative) of Southern California; Rabbi Shohama Wiener (Renewal), from New York City; Rabbi Mark Shapiro (Reform), from Glenview, Illinois; Rabbi Sue Levy (Reconstructionist) from Houston, Texas; Rabbi Laura Duhan Kaplan (Reconstructionist) from Charlotte, NC; Rabbi Yossi Carron (Reform) from Southern California; Rabbi Daniel Lev (Renewal) from Oakland, California; Rabbi Shefa Gold from New Mexico (Renewal); Rabbi Mel Libman from Honolulu (Conservative): and most recently, Rabbi Jack Gabriel (Renewal) from Berkeley, California; Rabbi Stephen Pearce (Reform) from Temple Emanu-El in San Francisco; and our own Shari Joy Berman of Kailua Kona and Japan. As a “staunchly non-affiliated” congregation, we feel fortunate to have received teaching, guidance and wisdom from learned rabbis that come from all of Judaism’s principal movements, Orthodox, Reconstructionist, Conservative, Reform and Renewal. A living congregation has the responsibility to educate its children to enable them to participate in Jewish life as they grow into adulthood, whether in Hawaii or elsewhere in the world. Learning what it means to be Jewish and how to be Jewish enables them to realize that they are part of a worldwide community, Klal Yisrael. During the 1990s, several members conducted a Hebrew Sunday School at their homes with volunteer teachers. At one time over 18 students were enrolled. Sharona Lomberg, one of the founders of that original Sunday School, later formed KAHEA (Kona Association for Hebrew Education and the Arts) as Kona’s Hebrew School. Neil Soicher and Ziggy Livnat (a noted Israeli underwater photographer) assumed the teaching responsibilities after Sharona, and the new program was dubbed HATS (Hebrew And Torah Studies). Shari Berman became the next HATS teacher and for several years, Trina Yerlick was the program’s regular teacher. We are taught that a Jewish community is expected to establish a cemetery even before it establishes a synagogue. Hawaii island’s only Jewish cemetery, Beit HaShamayim, was established by us in Hilo for that purpose in 2005.